Infinite Art Tournament: Saint of the Month: Saint Berlinda of Meerbeke! Saint of the Month: Saint Berlinda of Meerbeke! AKA: Berlindis of Meerbeke, Bellaude of Meerbeke. Credentials: Recognized by Tradition in the Catholic and Eastern Orthodox Churches. Patron Saint of: Protects trees and protects cattle against disease. Symbolism: Depicted as a nun with a cow. All English language sources that I have seen say that she carries a pruning hook or a branch, but they are probably wrong (see below). Saint Berlinda is said to have been the daughter of a medieval strongman, one Count Odelard. When the Count contracted leprosy, some sort of conflict developed between them. My sources (which are of course of the online rather than the scholarly variety) differ on whether Odelard just felt that Berlinda wasn’t going to take adequate care of him, or if he became angry after she declined to share a glass of water with him because of his condition. In any event, he kicked her out of the house. She took refuge in a convent in Moorsel, in what is today Belgium, and became a nun. After her father died, she moved twenty kilometers south to Meerbeke, where he had apparently been buried. She became an "anchoress," a sort of holy hermit, in a convent there. She is said to have spent her life helping the poor and suffering. That seems pretty much like a nun’s job description to me -- although not an anchoress', really -- so I’m not sure exactly what about her career qualified her for sainthood. Nor have I found anything in her tale that connects her with trees or veterinary practice. Presumably there is more to her story than the internet is letting on, or there was more to her story that has been blurred in the 1310 years since her death. Interestingly, she is said to have had an uncle saint, Saint Amandus. Can you imagine being a kid in that family? There would be enormous pressure to be well-behaved, I bet. The St. Pieterskerk website, incidentally, gives us the only internet image of St. Berlinda that I have been able to find (I reproduce it above, with thanks). Notice that she is carrying not a pruning hook or a branch, but a drinking cup. 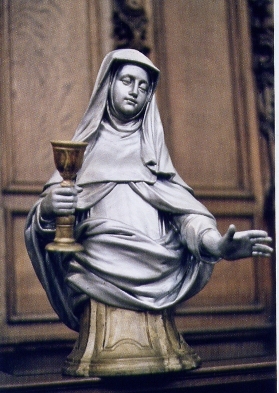 Also note that a drinking cup, as the St. Pieterskerk site points out (if my Flemish isn’t too rusty), actually has some relevance to her thinly-detailed legend, or at least to one version of it. This leads me to propose that the English-language sources may be just plain wrong about the pruning hook/branch business. If you happen to know a Benedictine scholar, please pass along my challenge. In the meantime, may your trees and cattle be in good health, and may you have a very happy St. Berlinda of Meerbeke Day! She does seem to be in her cups. I want to hear more about her cow! I did too! I couldn't find anything about the cow, though. Maybe they just assume that, being in Flanders, she must have been around cows a lot. Element of the Month: Curium!